I might be from the land of meat and potatoes, but you all know how that my heart lies with the green stuff. I rarely eat potatoes, but I just couldn’t pass up these little cuties. And since it’s summer, I felt I needed to share a true picnic/cookout side dish. These little ones grill up so well – they cook through without having to boil them first, and they get that nice charred edge. Off the grill, I drizzled them with a lemony dijon dressing. I let that soak in for a bit and then tossed them peppery arugula, pickled red onions, capers and chives. The end result… bright & tangy, filling but still light. I might just be eating a lot more potato salads this summer. We ate this alongside some grilled salmon. The leftover potatoes were even better the next day – I snacked on them for lunch, and then repurposed what was left for a second’s night dinner… I made full-meal salads by adding more arugula, smoked salmon, chopped cucumbers, pine nuts and a bit of the dressing that I had leftover. Slice potatoes in half and season with salt and pepper. In a small bowl, combine the red onions with sherry vinegar and salt. Chill while you make everything else (or make ahead, the longer they sit the better). Whisk together the dressing ingredients at the bottom of a large bowl. Set aside. Heat a grill pan* to high heat and brush with oil. Place the potatoes, cut side down and let them cook without moving them until nice char marks start to form (flip one to check). Flip them, add a good squeeze of lemon juice and continue cooking until roasted on the outside and tender in the middle. Reduce heat and cover if necessary (my grill pan doesn't have a cover, but we placed a baking sheet over it). I cooked my 1" potatoes for about 20-25 minutes total. Transfer cooked potatoes to the large bowl with the dressing and toss to coat. Let cool and toss with arugula, onions, capers, chives and lemon zest. Taste and add more dressing to your liking. Serve at room temp, or make ahead and chill. *if using an outdoor grill, you may need a pan or grill basket so the potatoes don't fall through the grates. You could also could boil your potatoes or roast them in the oven. Pictures are gorgeous! 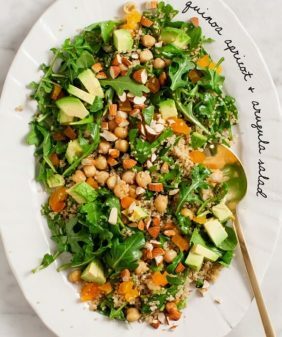 I love arugula and bet this is delish! I rarely eat potatoes either, and I love them so much! Love the look of this! These little new potatoes and sweet potatoes are the only kinds I’m really in to. This salad looks perfect. I’m really regretting not having planted rocket (arugula) this year- I miss being able to just pick a handful for salads. oh i adore waxy potatoes, especially when cold. I have been known the cook them in preparation for nibbles the next day or night. Grilling potatoes is such a summery idea that I have to try it, beautiful. Potatoes are some of my favorite vegetables ever–so much so that I’m totally willing to turn on the oven in the middle of summer occasionally. 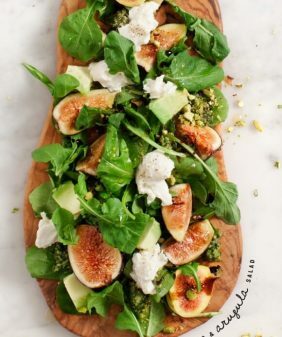 🙂 So amazing with greens in a salad like this! I loved these teeny ones because technically you could grill them outside and not turn on your oven. (Although where I live, our outside is an oven so we made them in our temperature-controlled kitchen :). Gorgeous! I love grilled potatoes and these flavors sound awesome! Those purple potatoes are the prettiest! 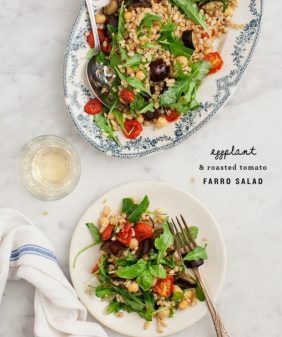 I absolutely have to make this, it looks like the perfect summer salad. Great share! This is the perfect dish for a picnic! 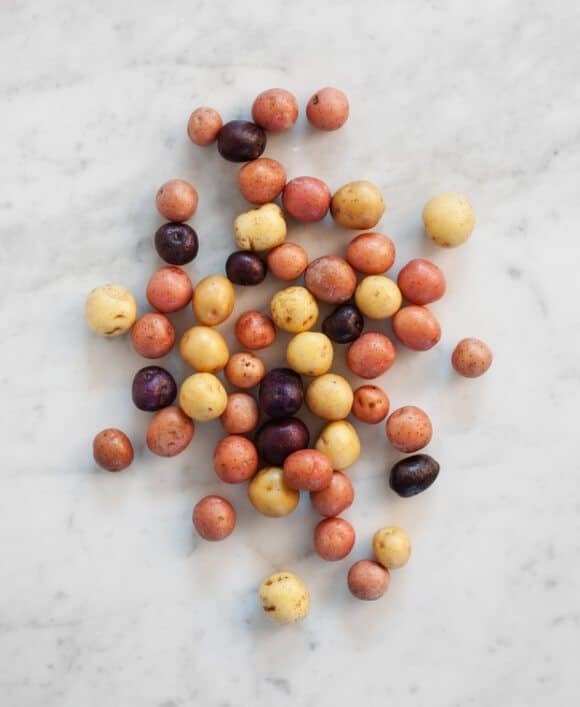 I love the different colored potatoes! Great post! 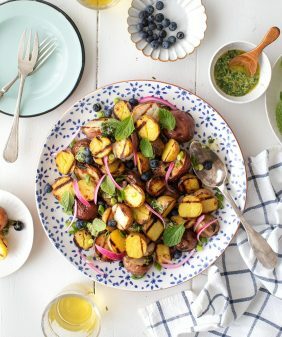 I love this idea of grilled potato salad especially when you use such overwhelmingly cute potatoes! 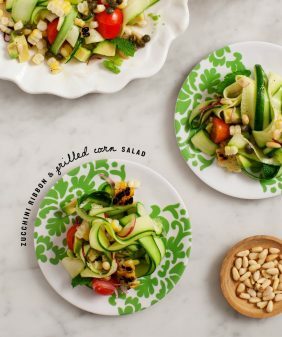 Another delicious summer salad that I can’t wait to try! 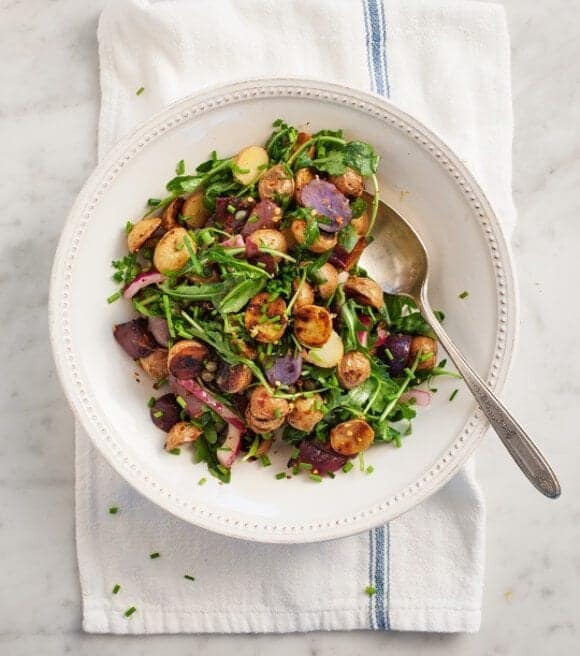 I love the addition of arugula to these warm potatoes. A little bit of peppery bite and pickled red onion with the mustardy vinaigrette, mmmmm! I simply love salads like this. And with salmon! I bet crazy good. I just made this salad last night and must say that it was just incredible. I didn’t have sherry vinegar, so used white balsamic which worked beautifully. Thank you so much for posting it, and for sharing so much on this blog. This is a fantastic recipe! My entire family (even the 11 year old) loved it. Thank you! This was the best OUTSTANDING! I made it tonight for a cookout we’re hosting tomorrow and it will be hard to not eat all of it before the morning. Thanks for mentioning that it tasted great the next day, it helped me feel safe make ahead! This is the first time I’ve commented on your recipes but my young daughters, husband and I have been knee deep in love with them for a long time now:) Keep rocking them! Hi Natalia, I’m so glad you liked it! I bet it was delicious with asparagus! We made this this past Memorial Day and it was delicious! A great way to add some brightness and flavor to the potatoes. We charred them a bit on the grill so they were crunchy too. Yum! sounds so good – glad you liked it!! As usual with your recipes, this one is another winner! I don’t have a grill pan or a grill so I roasted the potatoes until they were super crispy and that worked very nicely. Also, I added salmon and avocado for an extra boost, and the avocado was a nice finish. Thank you for your recipes! We made this tonight…..delicious! We served it with venison tenderloin and it was the perfect match. We added grilled asparagus to the salad and thought it was perfect. We will certainly make this again. Thanks for the recipe! Delicious! perfect dinner! i will try to make this recipe. 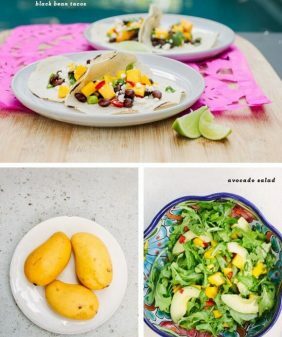 If you make this ahead to eat later do you still dress it before storing? If so, how long does the arugula stay good? Hi Chitra, I stored it with the dressing. The arugula wilts, so you might want to toss that on when you’re ready to serve.